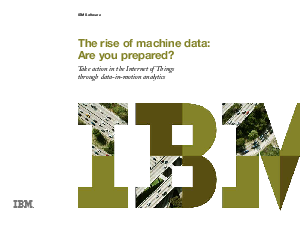 Home > IBM > The rise of the machine data: Are you prepared? Read the ebook to learn how to 1) Gain real-time insights into operations, customer experience, transactions and behavior; 2) Identify and investigate anomalies, 3) Monitor end-to-end infrastructure to proactively avoid service degradation or outages. Learn how to uncover actionable insights through the IBM big data platform.